A couple of Rare Earth Magnets were added, to keep the lid from jiggling when closed… I may still mix up a batch of sawdust and Poly and hide them…? Of course, it doesn’t hurt when Mother Nature contributes some of her best to the project too! Nice work as usual Mike and a beautiful result. Glad to see you are back at it. Mother Nature does indeed provide doesn’t she Mike? That is some gorgeous rosewood. That said, nice build on this project and I’m happy to hear you had fun making it. Thanks for the reminder that making these projects should be just that. 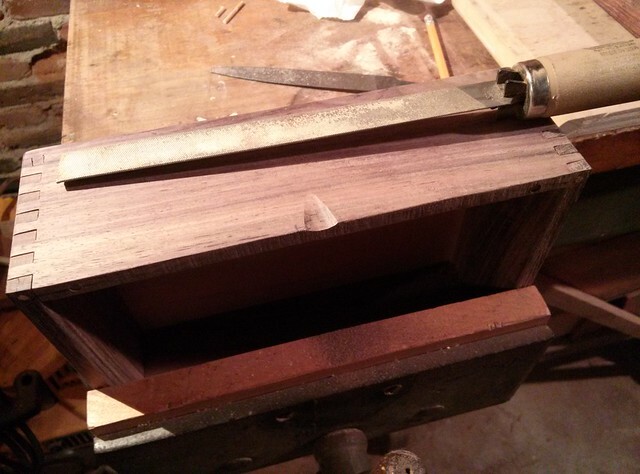 Nice box….Definitely a curly maple. Looks like your box joints are nice and tight, I think your relaxed attitude is showing up as finer workmanship. Mike, nothing like having some fun with wood and producing an very attractive product as a result. A very good example of what can be produced from resawing and selection of timber to show the effects of how grain flow is used. Add a contrasting lid insert and hinges and you have a winner. Nice touch with the wooden nails. Beautiful work as always. Glad to see you are able get back to the hobby. Your stuff is always a pleasure to view. Great looking box—very nicely done. That turned out very classy! Love the wood combination and you know I love your hinges! I really like the way you made the lid lift! 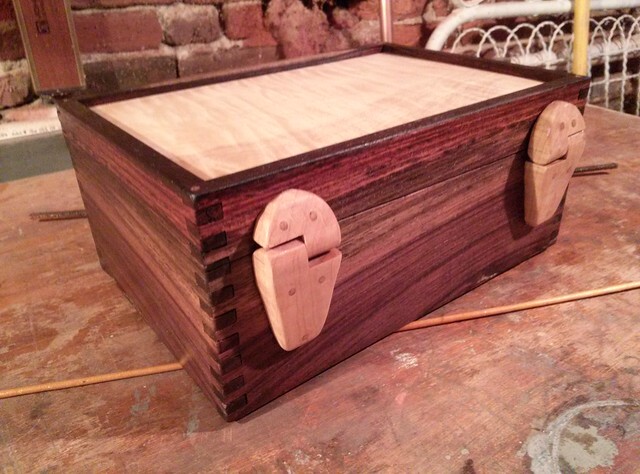 Very nice box Mike, the wood is beautiful…great job.